Learning to choreograph is first of all a matter of having time, space, opportunities and freedom to experiment, and to look for a working method, content, dramaturgy and form. P.A.R.T.S. does not presuppose specific aesthetics, methodologies or definitions of authorship, but provides coaching and feedback by teachers and invited artists. In the 1st year, all students create a solo, to be presented at the end of the year. Students organise themselves, feedback and coaching is provided through working groups, where students develop peer-to-peer support and feedback, guided by an experienced coach. In the 2nd year, all students create a duet, which is framed as a specific task: to develop a work relating to a specific musical composition, to be chosen from a predefined list. Students also collaborate with musicians who perform the music in the presentations. In 2014, the musicians were students from the post-master program Contemporary music from KASK, Ghent. In the 3rd year, students work in larger groups to create new work, guided by one or more from their peers or as a collective creation. In the 3rd year, students can propose personal work projects instead of specific workshops, for research and/or creation in small or larger groups. Each group can benefit form the support of a mentor. During an X-Week, the normal operation modus of the school is suspended. The invited teacher can work with the students from morning until evening, five days long. The teacher can work in the school or outside school. The subject may be composition or improvisation, but also politics or visit to museums and exhibitions. We ask the artist to unveil their way of approaching art towards the students. Doing an internship in a professional environment is possible in the 3rd year, in the period of the external project. The students who are interested take the initiative to look for a temporary position in a company, as dancer or artistic assistant. The program can contain other special projects, either as integral part of the curriculum or as an optional extra. In 2013-14, choreographer Cindy Van Acker created a site-specific work for the 53 students in Ostend, as part of the Dansand festival. 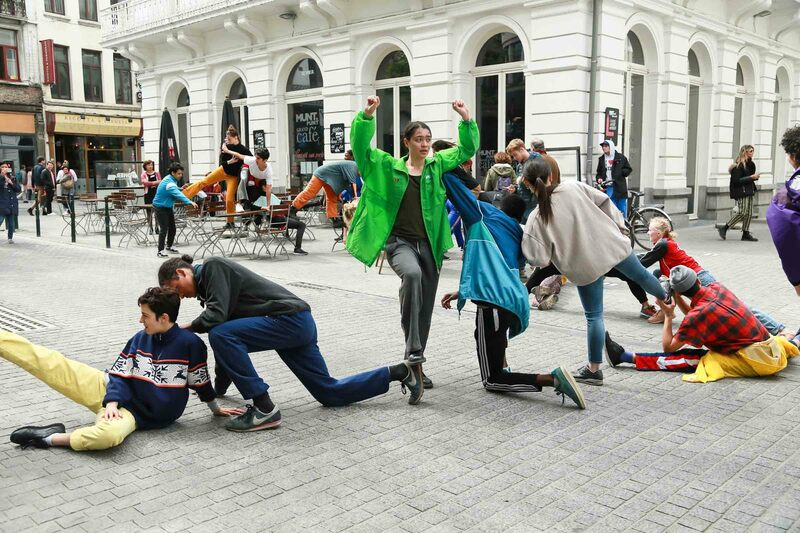 Students worked with choreographer Femke Gyselinck and musician Lander Gyselinck on a structured improvisation performance on the occasion of the national Kids’ Arts Day. Students were also involved in the Museum Night Fever at the Wiels Contemporary Arts Center, working with visual artist Franz Erhard Walther.